The East Village is a haven for great eating. Mexican, Thai, Vegan and Italian to name just a few. But the one cuisine they lack is Indian – until now. 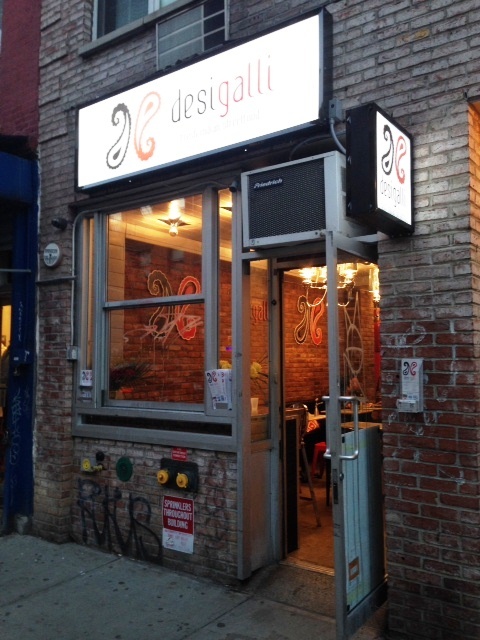 Because Desi Galli has recently come to the hood (172 Avenue B) and the residents are rejoicing. 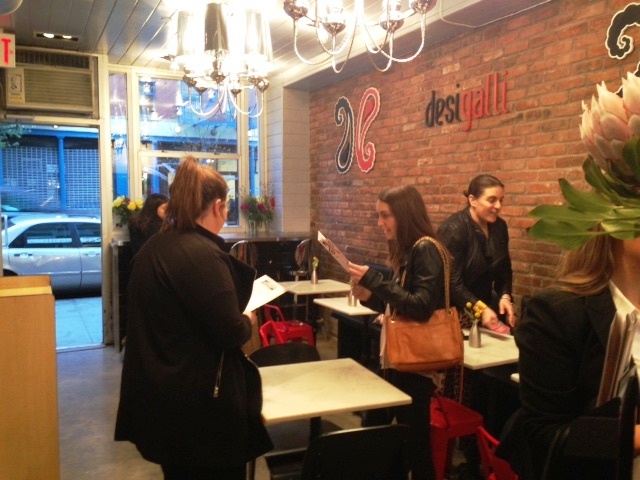 Desi Galli is known for Indian street food that is both tasty and inexpensive, a perfect fit for the East Village. 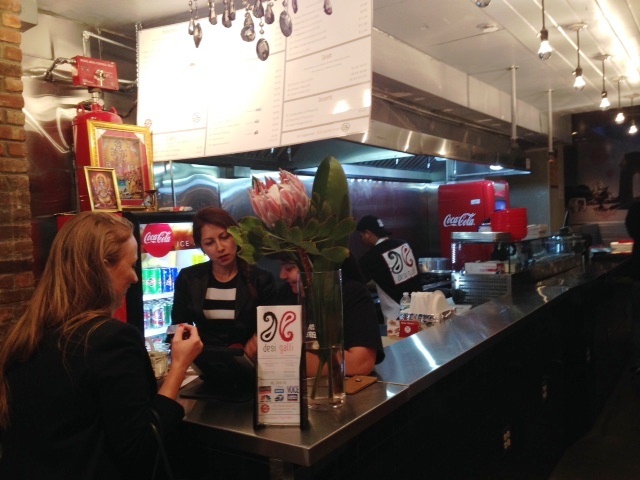 Cheapeats was recently invited to sample their newest location and boy were we excited. We were greeted with smiles and invited to head over to the open kitchen counter and place our order. 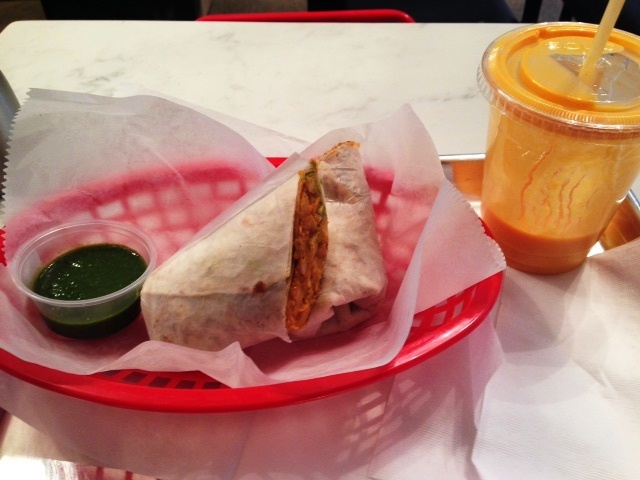 We decided to go with their spiced chick pea /channa and potato/aloo Kathi which is like an Indian burrito. It comes with a side green dipping sauce that is similar in flavor to cilantro but packs quite a punch of heat. This wrap is Vegan and gluten free friendly. The spices are mixed to perfection and hearty enough for any carnivore. The drink of choice was their infamous Mango Lassi, which is like a smoothie. The creaminess of this lassi is the perfect balance to the spiced Kathi. Combined this would run you about $11-$12. Owner Pria Vanda is originally from Montreal and what they’re known for is poutine. What is poutine you ask? French fries with gravy and cheese curds. So Pria has brought that to this location Desi style. 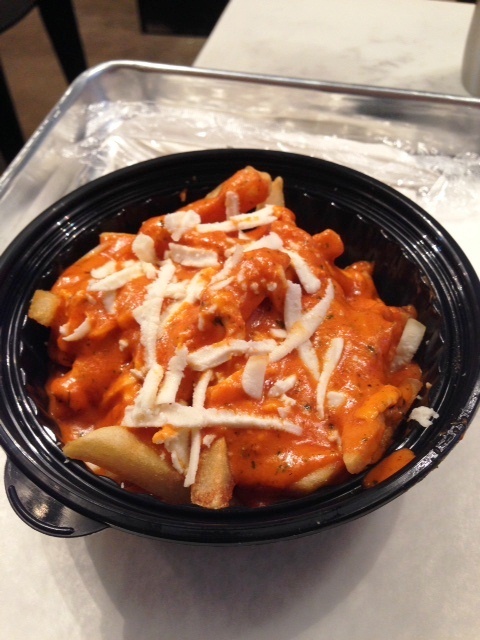 The Desi fries, which is only available in this location, is a combination of fries lightly bathed in Tikka Masala Sauce and sprinkled with cheese. With one bite, you get a mix of salt and sweet. My immediate reaction was – this is the perfect hangover food. Sooooo good! Desi Galli is open for lunch and dinner daily. And if you happen to be in the barhopping in the hood – they’re open to 3am Thursday, Friday and Saturday. Woo! Hoo! This entry was posted by Rosemarie on Tuesday, April 26th, 2016 at 10:39 am	and is filed under East Village, Indian, Manhattan. You can follow any responses to this entry through the RSS 2.0 feed. You can leave a response, or trackback from your own site.